A public conference “Looking back or looking forward?” provided an opportunity to draw a wider public into the conversation on Europe’s Diasporas. The conference was hosted by the Roma Access programme of the Central European University during which Armenian, Jewish and Roma speakers shared their vision of how to preserve their heritage and popularise it in Europe. “Heritage is wealth and is transferred to you if you accept to receive it. That heritage is a ring in a chain. If it breaks then the rest may disappear. I think every generation is a part of that ring that needs to maintain and transfer that wealth,” said Yervant Zorian, the founder of Armenian Virtual College and AGBU central board member. “You should share who you are, you should share your heritage, even if you have questions, even if you have doubts and insecurities as an Armenian, Jew or Roma. The doubts are also a part of the journey who we are,” said Zsuzsa Fritz, the director of Balint Jewish Community House. The “Diasporas’ Heritage and Remembrance” seminar also created an opportunity to compare the challenges which the diasporas face in Europe. The issue of dispersion was recognized as a common concern for all Diasporas that challenges them to be organised and collaborate within the communities. Dispersion can result in a lack of recognition, misrepresentation and prejudices. 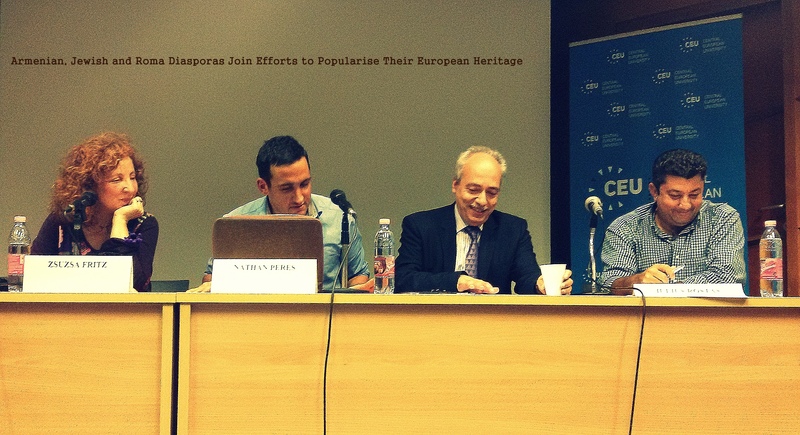 A number of initiatives were identified to help promote the heritage of diasporas in Europe. The project plans to organise a cross-cultural exhibition to showcase their footprint across Europe. They also identified a need for education about diasporas in schools and intend to work on an educational package. As a contribution to the discussion several speakers were invited to present existing outstanding European projects. The European Jewish Heritage Route project creates Jewish itineraries in European countries to introduce the cultural and physical inheritance of Jewish communities such us synagogues, houses, community centers, and industry. AGBU’s Armenian Virtual College, the European Roma Institute and the Armenian pavilion at the 2015 Venice Biennale, “Armenity” were the other projects presented at the gathering. The “Diasporas’ Heritage and Remembrance” seminar participants agreed to closely cooperate on remembrance issues and in organising commemoration events. The Roma Pride which was held in Budapest on October 17 also provided an opportunity for members of each diaspora to express their solidarity with the Roma community. The next seminar, to be held in Sofia in January, 2016, will bring together the participants in the “Europe of Diasporas” project on the subject of education and empowerment to discuss further steps and finalise the proposals to be presented at a European Conference in April 2016, in Brussels. AGBU Europe can provide more details and is available for comments. The “Europe of Diasporas” is a European project and is a first step towards the establishment of a network of diasporas in Europe. This network will aim to help develop, affirm and popularize the notion of European diasporas and encourage the idea that identities need not be tied to a territory or to a source of authority to be legitimate and valuable. The European Union of Jewish Students is a pluralistic, inclusive and non-partisan umbrella organization that supports Jewish student unions throughout Europe and represents its members in international institutions and organizations. AGBU Europe coordinates and develops the pan-European activities of the Armenian General Benevolent Union. Established in 1906, AGBU is the world’s largest non-profit Armenian organization. AGBU Europe runs numerous programmes in fields relating to academic research, the preservation and promotion of heritage, education and culture as well as awareness raising, advocacy and leadership training.